Used under license by Rainbow Productions. Primary Target: Children aged 2-6 years old. Secondary Target: Parents, Millennials, Tweens/Teens, Infants I.e. a multi-generational brand. These are the official Care Bears – Cheer Bear licensed characters, Care Bears – Cheer Bear. We take care of everything; our full service includes the copyrighted character costume, trained performer and Road Manager (minder) to accompany the character. Please visit our character events page to find out more. Due to the nature of the events we manage, we are not able to supply characters for private children's parties or similar events. Our licensed character costumes are not available to hire on a costume-only basis. Characters are booked at a single day or an overnight rate, depending on event location, rather than for shorter time periods. Our aim is to bring these famous characters to life to create a magical experience for children when they meet the characters. The Care Bears is a group of bears created by American Greetings Entertainment. The brand aims to teach fans around the world about the importance of caring and looking out for others. 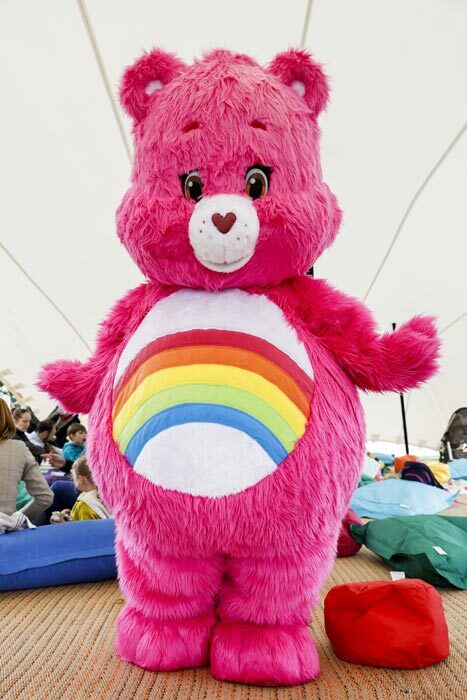 Each Care Bear is a different colour with a special belly badge depicting their personality and caring mission. 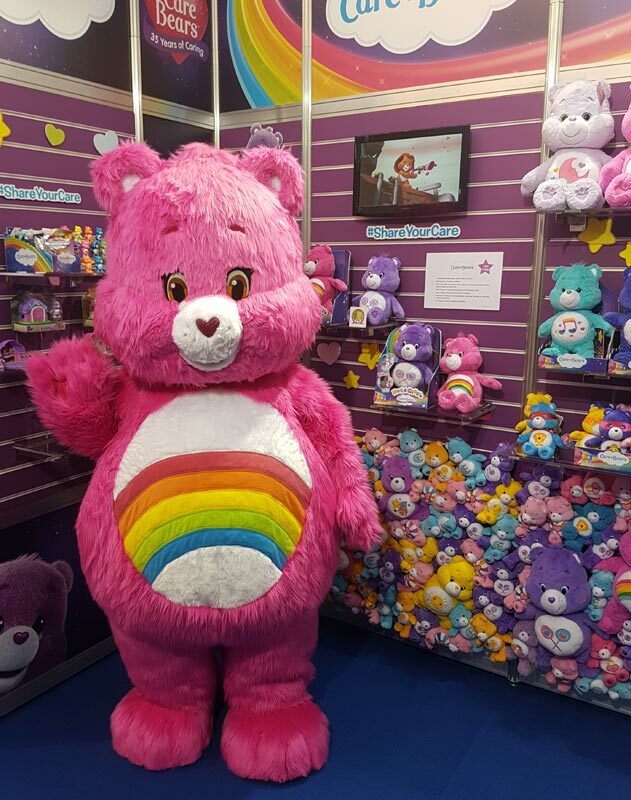 Cheer Bear is pink bear with a multi-coloured rainbow belly badge. She is always very happy and perky and makes it her goal to make everyone around her as joyous as she is. She is bouncy and playful and only ever depressed if she fails to cheer someone up! 2017 was the 35th Anniversary of the Care Bears. The Care Bears were first introduced by American Greetings in 1982 as consumer products and greeting cards – and later as an animated television show. 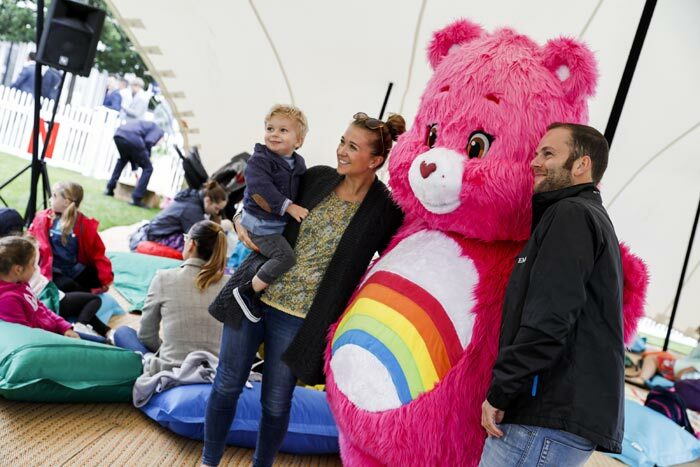 TV series ‘Care Bear & Cousins’ launched on Tiny Pop in July 2018, plus brand new show ‘Care Bears: Unlock the Magic’ launches Q1 2019. There have been three feature films: The Care Bears Movie (1985), Care Bears Movie II: A New Generation (1986), The Care Bears Adventure in Wonderland (1987).